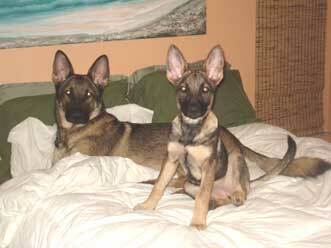 Gunnar is a 1 year old Sable, and Bella is his little sister (same parents, different litter) she is 3 months old. They are inseparable. Gunnar loves to go running with me on the skateboard and Bella runs behind us barking, and barking until she catches him. Its like she is yelling at him "don't you leave me like that ever again!!" They curl up together at night and fall asleep. The two best shepherds!! :) I could never imagine life without them.